YOUR or YOU’RE? What’s the difference? A common error in English is confusing YOUR and YOU’RE. YOUR is a possessive adjective. Follow YOUR with a noun (a person, a place, or a thing). The noun belongs to you. As you can see from the examples below, it sounds odd to say that a person, or a place, or even some things belong to a person, but it can be helpful to think of belonging for the purposes of getting the spelling right! 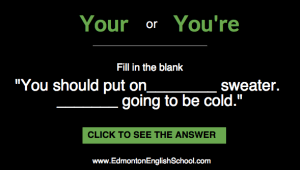 YOU’RE is a contraction. It always means YOU ARE.